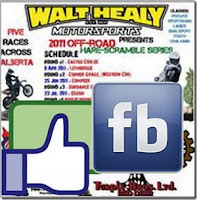 The Second Gear Club is excited to launch its official Facebook page for its CMA Harescramble Series in Alberta! http://facebook.com/harescrambles – Like them today! With Facebook becoming the prominent source for many racers to share race news, photos, video & results, we are thrilled give racers a new venue to share all their bench-racing stories. We can’t wait to see what cool helmet cam & photos racers will post from their adventures in the Alberta CMA Hare Scramble Series! Lets see that awesome pass or gnarly wipeout! Racers will be able to check out sponsor promotions, upcoming race information & sneak peaks to races such as the infamous Corner Grass Enduro Hare scramble and the challenging Fisher Frolic in McLean Creek.